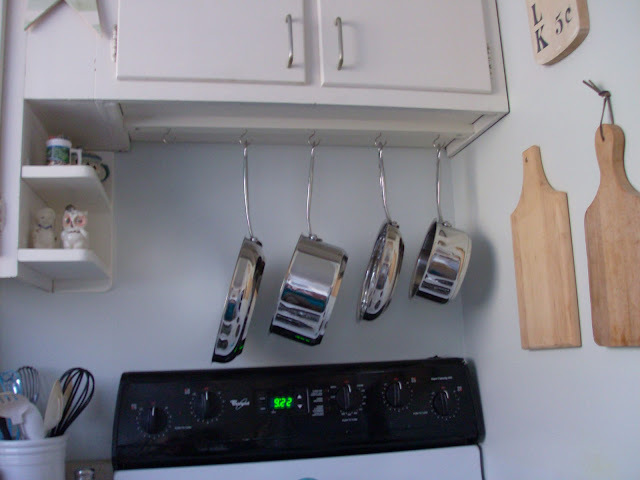 Since I have very limited cabinet space in my small galley kitchen, I decided to hang my new stainless steel cookware above my stove for space-saving, quick access. The only problem is that the space is only 28" long and 18" tall which is way too small for a traditional pot rack. So, I went online searching for possible solutions and found the one pictured below by AK Adams Co. This one looked like a very workable solution for my space at only 20 inches long, but it carried a hefty $50 price tag. Needless to say $50 was way out of my price range, so I set out to come up with a similar, cheaper, DIY version. 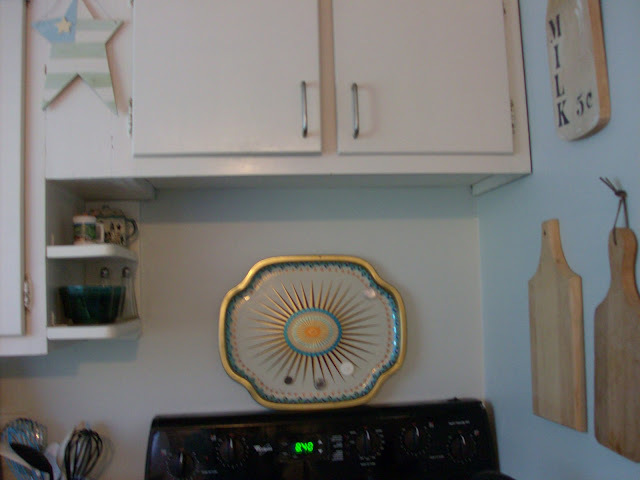 I began by cutting a 1" by 1" wooden strip to the length of my cabinet, which I then painted white to blend in with the overhead cabinets, and screwed it into the bottom of the cabinet on both ends. Next, I screwed 5 nickle cup hooks that I had purchased into the 1" by 1" board. 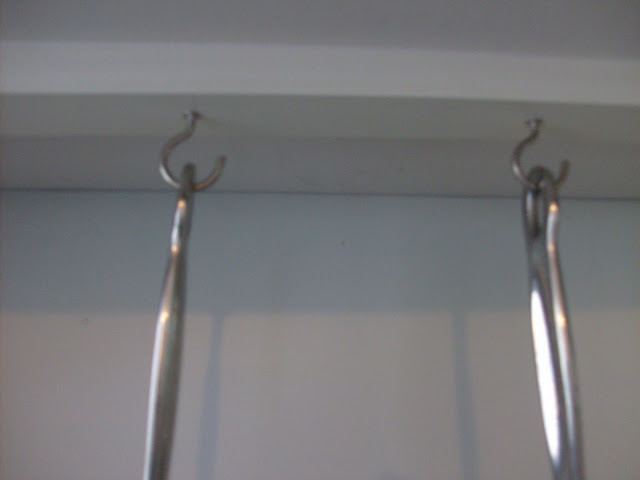 Each hook holds up to 20 lbs. 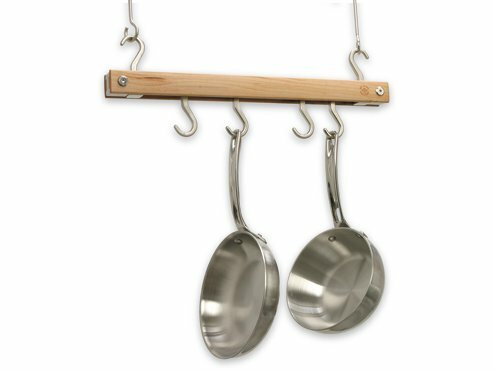 So I created my own "centsibly chic" hanging pot rack for only $4 (the cost of the hooks), and I am so pleased with it! Not only do I now have additional storage space, but all my shiny sleek pots are within easy reach. Who knows, maybe I will be inspired to cook more since I won't have to dig through my cabinets for pots anymore. Now I just need to find a way to get the lids organized. Hmmm.... Anyone got any suggestions? Great job! I've seen several ideas on Pinterest. You can buy a cheap (IKEA) towel bar(s) and install them on the inside of a cabinet door. Search for "pot lid storage" on Pinterest and you should be able to find it. If you need a storage solution for tupperware/gladware lids, use old CD racks. Hope this helps! Thanks so much Alicia, I found lots of ideas on Pinterest. Only recently discovered Pinterest and I don't utlize it enough. Love your idea about using old CD racks. 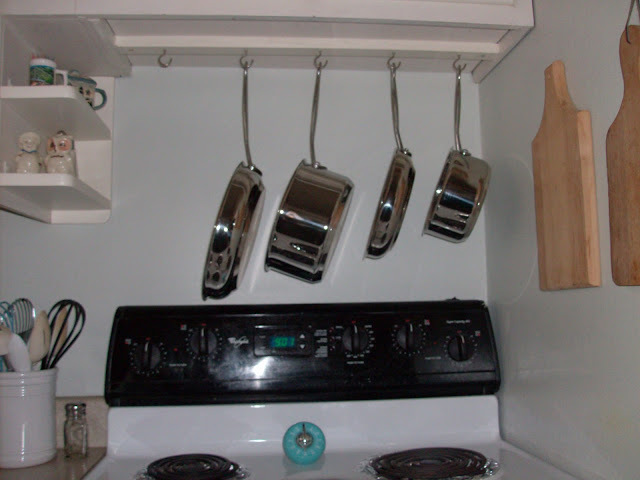 Hey, I am doing something similar but did you have trouble drill into your cabinets? I am concerned with the bottom of cabinet falling down lol. Thanks for visiting. I have solid wood cabinets so the bar is very sturdy. I used 3 long screws, one at each end and in the middle to secure it. Great idea about the lids.